Wow, what an amazing resource for all coaches! Tactical Soccer Coaching – Systems of Play, Strategy and Analysis, is a two volume set featuring the same kind of course material found in accredited academic courses. This makes it perfect for developing your knowledge of key concepts and continuing to grow your coaching knowledge. If you’re a coach in the game, it can be daunting to know where to get your coaching info from? There’s just so much to learn and so many resources available that it can seem impossible to know what to study first. Should you be reading every match report? Getting advice from TV pundits? Or taking a special course? To solve this dilemma, we created the Tactical Soccer Coaching two volume set. This provides the perfect pathway to advancing your knowledge because it covers all the key concepts in a logical and cohesive way. This includes the game’s history, the evolution of formations, how to perform an expert team analysis, systems of play and practical exercises and drills. Tactical Soccer Coaching – Systems of Play, Strategy and Analysis, gives you answers to all the troubling questions you may have as a coach while advancing your knowledge to an advanced level rapidly. This will give you a big advantage when getting accredited, as you’ll be clued up on the core concepts and know the answers to the key questions. Tactical Soccer Coaching features the same type of material that’s found in the fully accredited Premier Select and Elite Champion courses run by Education Football. They are both academic courses in soccer concepts, and studying them by reading the Tactical Soccer Coaching series will provide the perfect foundation on which to build your knowledge..
Education Football is an institution created by the authors of Tactical Soccer Coaching to provide a variety of academic courses on soccer concepts. All of the courses are designed to provide a cohesive way of sharing all the extensive information they’d collected and learned on soccer concepts over the years. 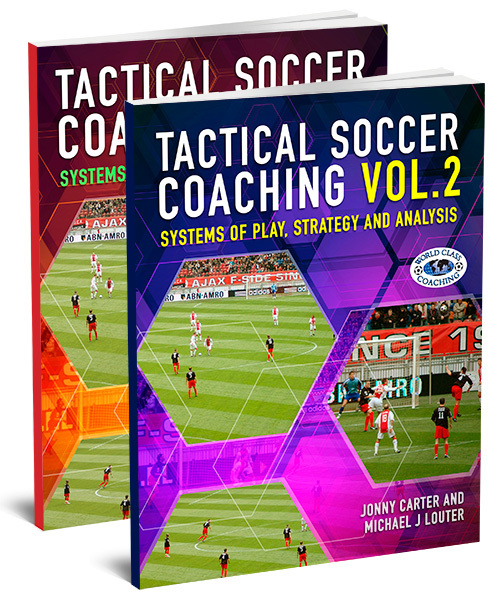 So when you buy Tactical Soccer Coaching Volume 1&2, you aren’t just buying two books on coaching. Each book contains videos to highlight the topic of that chapter. So you’re getting an entire educational depository you can dip into whenever you need clear answers on all the key questions when getting started as a coach. Tactical Soccer Coaching – Systems of Play, Strategy and Analysis has been created by two coaches – Jonny Carter and Michael J Louter – with extensive experience of running and assessing soccer mentoring programs. Michael J Louter has spent his life studying soccer coaching. In particular, he specializes in soccer psychology and the technical and tactical components that need to be combined to build a successful team. 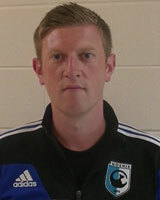 While running elite soccer camps at Vitesse, Louter has been able to witness the benefits of his coaching philosophy firsthand. Through coaching at the camp’s state-of-the-art facilities in Tennessee, Louter has been able to work with elite level players and to further expand his vast coaching knowledge. 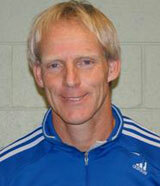 Louter holds a USSF ‘A’ Licence and an NSCAA Premier Diploma. 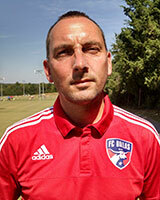 He is currently the Director of Coaching at FC Dallas Tri and oversees the development of the U15-U19 teams. Tactical Soccer Coaching Volume 1&2 features all the coaching material from Education Football’s Premier Select course in volume 1 and its Elite Champions course in volume 2. The first volume covers the history of soccer and the evolution of its formations while volume two is focused more on the practical side of training and analyzing your team’s performance. Both volumes include videos to enhance the coverage of the topics. Section 1 – The history for soccer, from the Roman Empire to ‘mob’ soccer in medieval Europe to the creation of England’s early Football Association and more. This section also looks at how formations have evolved over the centuries. Section 2 – Contemporary systems of play, from 1872 to the present day, including Manchester United, Spain, Mexico and Juventus. Section 3 – National stereotypes, such as Holland’s ‘Total Football’ in the 1970s, the Brazilian Box and England’s love of playing with a number 9 striker. Section 4 – Balancing the Team Shape, with pairs, groups, teams and points of failure to avoid. Section 5 – The attacking and defending principles of soccer and key terminology. Section 6 – Penetration with a 2v1 versus a 1v1, Dribbling, technical training, game related and game specific, conditioned and match play exercises. Section 7 – Playing possession football, counter attacking football, constructing counter attacks, progression, constructing, counter attacking patterns, defensive principles for when the team is disorganized. Section 8 – When to use high pressure or low pressure defending, and its dangers and flaws.Pressing tactics and holding a high defensive line. Section 9 – Playing with a skewed defensive line when there’s no pressure on the ball. The principles of having an educated defensive line. Section 10 – Box organization. Front post runs, penalty spot runs, exploring creative wing play, progressions and exploiting creative wing plays. If you’re interested in advancing your coaching career, Tactical Soccer Coaching Volume 1&2 provides the perfect place to start building your knowledge foundations. It features content plotted in the exact same way as it’s taught at Education Football’s Premier and Elite soccer theory courses. This enables you to gain the same quality of information as an accredited training course without having to attend a single lecture. A complete collection of drills for improving penetration, possession, high or low pressure defending and being better organized in the box. Ultimately, what you gain from owning Tactical Soccer Coaching Volume 1&2 is a central resource you can dip into whenever you need answers to common questions as a new coach. This saves you from trying to piece together bits of coaching information from many different sources, as everything is collected for you and presented in a cohesive format. WORLD CLASS COACHING is recognized globally for the quality of its soccer coaching resources, which are used by over 40,000 soccer coaches from around the world. 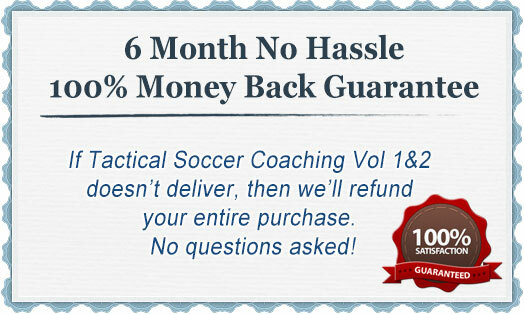 We wouldn’t be offering you Tactical Soccer Coaching Volume 1&2 unless it achieves our exceptionally high standards. However, if you are not 100% satisfied with the quality of Tactical Soccer Coaching Volume 1&2 after six months then please contact us for a no quibbles refund. There’s literally hundreds of soccer books and videos you can learn from, and that’s just from the WORLD CLASS COACHING library. So it’s daunting to know where to start when you’re just getting started in your coaching career. This is just one reason why Tactical Soccer Coaching Volume 1&2 is the perfect starting point for building your coaching knowledge. It collects together answers to all the key questions in an accessible way so you can quickly advance your knowledge without wasting time trying to piece it all together yourself from many different sources. Tactical Soccer Coaching Volume 1&2 also provides you with course quality content you can study at home at your leisure. So if you’re looking for a pathway that develops your coaching knowledge, Tactical Soccer Coaching is a great place to start. P.S. 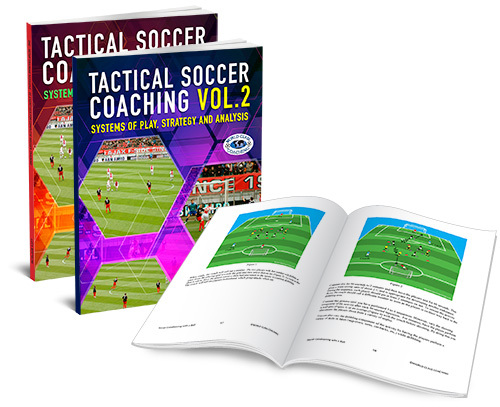 Tactical Soccer Coaching Volume 1&2 is a two volume set featuring the exact same material as in Education Football’s accredited Premier Select and Elite Champion soccer coaching courses and includes 11 videos. This provides you with a comprehensive go to resource for answers on common questions and the perfect pathway to getting qualified. P.P.S If you are not 100% satisfied with the quality of the soccer coaching resources in Tactical Soccer Coaching Volume 1&2 after six months then we will refund your purchase in full, no questions asked.